Mandarin Magic Cake is one of my favorite cakes. My Grandmother McDowell made this cake so many times when I was growing up. 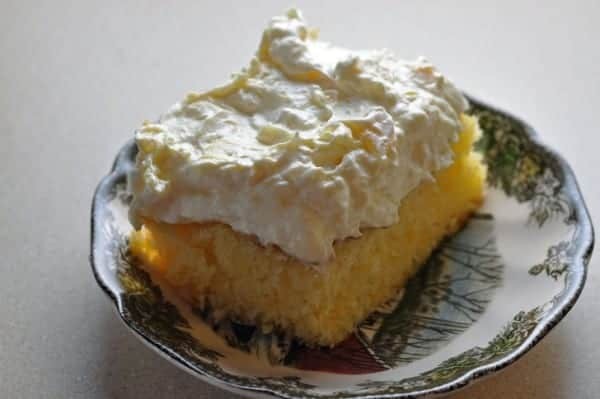 This cake is made with a boxed cake mix, to which you add a can of mandarin oranges, and the icing is made with pineapple, vanilla pudding and Cool Whip. This is so easy to put together, and tastes so delicious. Mandarin Magic Cake was a cake I loved when I was growing up, this cake is served chilled, so it is super refreshing. Mix together cake mix, flour, eggs, oil, and mandarin oranges and juice; pour into a 9 by 13 inch greased and floured pan. Bake for 30 minutes or until done. Mix the whole can of pineapple along with the juices with pudding powder and Cool Whip. Spread over the cooled cake. Keep this cake refrigerated. I Made this cake yesterday, It was very good. Not too sweet. Would make this one again. The family loved it! Yam, I just love fruit cakes, especially orange made. just made this, it’s delicious and perfect on this hot summer day! I love mandarin oranges, especially when added to a salad. I bet this cake is delicious! Made this yesterday for company and they loved it! I made this cake and it was a hit, my S/o couldn’t stop eating it, so light and fluffy. It is a keeper. Do you drain the pineapples or just put all the juice in there also? Yes, empty the whole can into the frosting. I have made this cake for many years. This cake makes a beautiful presentation when done in 3- 9″ pans. I save a few of the orange slices to decorate the top and it is so much better if the cake is allowed to chill before serving. The instant vanilla pudding works very well. perhaps substitute cream cheese, or cream ? You know what I would do, is to use your favorite cream cheese frosting, and leave out the vanilla pudding, but add the pineapple. Cool Whip is a brand of whipped topping.. whipped cream. Like what is put on top of an ice cream sundae. Is there no version of that in Australia? Interesting. Cool Whip is unavailable in Australia, and apparently so is Velveeta cheese. I remember this, to make it lighter, has anyone tried to leave the oil out? It has the liquid of the oranges. I personally wouldn’t try this. I don’t think it would work well. I think you needsome oil in here for structure, but if you do try it this way, please let us know how it turns out. My brother used to make this cake every year at Christmas. He had to make one just for me!